Black and White Cookie Cupcakes. Kid Approved! This sunny spring weekend I attended my nephew's third birthday party. "I'm three!" He shouted. So cute. Black & White Cookies: NYC Treat. As an auxiliary cupcake option for the kids and adults at the party, I made "Black & White Cookie" Vegan Cupcakes. 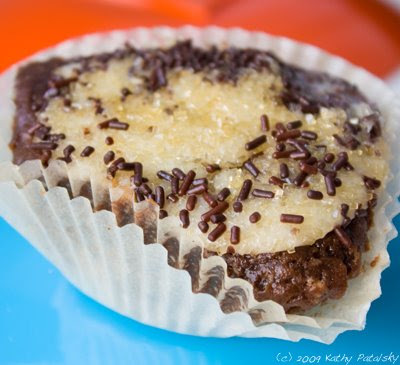 These cupcakes taste like a slice of NYC foodie style! NYC is famous for B&W cookies. 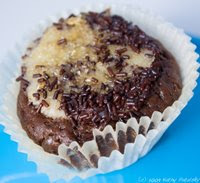 My recipe combines a rich double chocolate cupcake with a 'graham cracker cookie crust' cupcake bottom. Then a black and white sprinkled white glaze frosting. I packed up the cupcakes and trekked them to the party, where not to my surprise... the vegan cupcakes were a big hit! And since there is no dairy in the cupcakes, I don't have to worry as much about the non-refrigeration transport time. Just one benefit of non-butter cream/vegan frosting. "VEGAN" Cupcakes. I love how everyone calls them the 'vegan' cupcakes, while all the traditional cupcakes are just 'cupcakes'. Both the adults and a few kids were shocked to taste 'vegan' cupcakes that tasted so decadent and yummy. My sister's fresh strawberry frosted cupcakes were quite a hit too, but not vegan, so that kills it for me. *optional, makes for a creamier, whiter frosting. 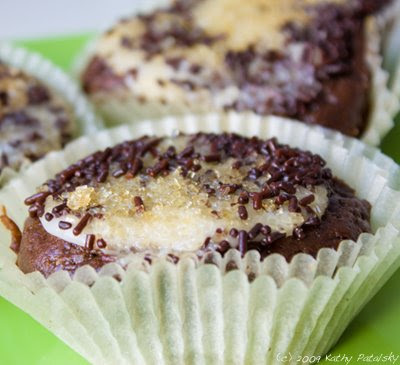 Toppings: Vanilla Flavored Sugar, thick cut (or raw sugar) and Vegan Chocolate Sprinkles. In a large mixing bowl, combine cake mix, vital wheat gluten, whole wheat flour, cinnamon and cayenne. Add in liquids: soy milk, vinegar, and canola oil. Stir well until batter is smooth. Prep your muffin baking pan. Gather your unbleached baking cups and line pan. I actually like to use a round cake pan, so that I get odd-ball shaped cupcakes. They come in trapezoid and cube-ish shapes instead of traditional round. But you can do either way! Spray muffin liners with high-heat canola oil. Drop in about 5 chocolate chips into the bottom of each muffin cup. Then crumble in about 1 Tbsp of graham cracker crust or crushed graham crackers into the bottom of the cups. This will be the 'cookie' part of the muffins! Then spoon about 2 tbsp of muffin batter into each muffin cup. Use all the batter. BAKE muffins at 350 degrees for 16-18 minutes. Until tops are firm and nicely crusted. In a food mixer or processor, or with a beater, add all the frosting ingredients-except only half the amount of sugar. Once the frosting puree is mixed, add in the rest of the sugar slowly until a desired consistency is achieved. Remember, the frosting will harden slightly when cooled in fridge. Spoon the frosting into a container and stick it in the fridge until it is needed. Remove muffins from the oven and allow to cool. This should be about 20-30 minutes. In a huge rush? Place them in the fridge. Make a sprinkle dipping plate by adding about 1/4 cup thick cut sugar and 2 Tbsp chocolate sprinkle to a plate. Try to keep the toppings separated 1/2 and 1/2 - it depends how perfectly you want to 1/2 and 1/2 top your black and white cupcakes. Spoon about 1 Tbsp of frosting onto each cupcake. 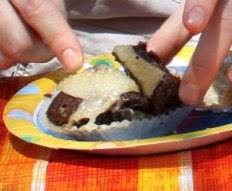 Dip the top of the cupcake into the sprinkle plate, in a rolling motion. Coat the frosting in black and white sprinkles. and sugar. 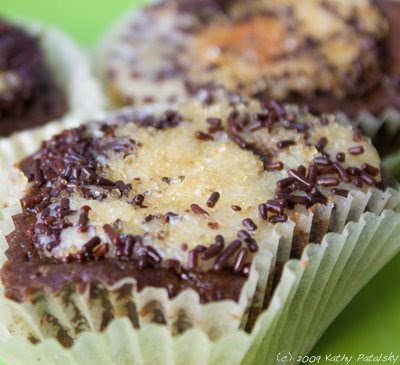 Place the cupcake on a serving tray or in a Tupperware container to be transported. Refill the sprinkle plate when it gets low and continue frosting and dipping the cupcakes. Place the cupcakes in the fridge until they are ready to be served! Or eat immediately. Allow the cupcakes to 'warm up' for at least ten minutes before serving. SERVE! Proudly, tell your cupcake customers that these Black & White Cookie Cupcakes are vegan cupcakes, a slice of NYC foodies style and delicious! !